Housing associations make a significant contribution to local communities across England, and a recent National Housing Federation Neighbourhood Audit (2009) estimated the annual value of this at over £430m. This investment contributes to the success and stability of local communities, many of which are deprived. However, the investment is an ‘input’ in to local communities – what is less clear is how housing associations contribute to local outcomes, especially via Local Area Agreements and Sustainable Communities Strategies. What is quality of life like for local people in areas where housing associations have homes, and are things getting better over time? Are housing association initiatives and interventions making any difference in terms of local quality of life? The new Government is reshaping the national policy landscape and new initiatives around Localism and the Big Society seem destined to change how housing associations work. This study is, therefore, timely, as it shows the impact that associations can have at the local level in an evidenced way. In keeping with many traditional associations, the stock for both Nottingham Community Housing Association (NCHA) and Longhurst Housing Group (LHG) is spread in relatively small concentrations across many local authority areas. The Project selected five study areas which could be studied in more detail and at the required fine level of spatial geography (the fine grain was necessary as the studies would use statistical geographies at individual neighbourhood level). The case study selection methodology itself was not considered fundamental to the project success. The key requirement was to develop an analytical model that could be applied in any area. The impact of place on shaping life chances and successful communities is well documented in numerous studies. Housing associations have long recognized the importance of place e.g. via the long running ‘iN business for neighbourhoods’ campaign. 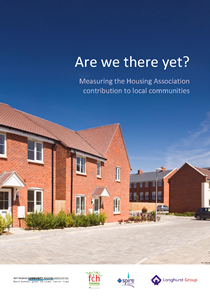 This study has highlighted how the housing association contribution to successful communities can move forward as an evidence-based approach – showing a connection between investment and neighbourhood outcomes. Although the study is primarily focussed on assembling evidence to show what is happening in communities, a number of strategic issues have also emerged. The 5 study areas each exhibited a variety of local differences, arising from their own local history and heritage – some are relatively successful, some less so. Therefore it was felt inappropriate to draw comparison between them because of legacy issues – each is unique in its own environment. Nevertheless, some of the study areas are highly challenged and some very deprived. This is not a reflection on RSL performance – many RSLs, including those in this study, came into being to tackle poor quality housing, meet housing need and improve life chances, and this was usually in highly challenged neighbourhoods. Although some of the study areas are relatively deprived, the core landlord function that housing associations undertake is generally positive – the Barriers to Housing Services IMD Domain (which includes a range of different indicators in its score) shows a relatively positive result in all the study areas and consistently outscores other IMD domains for the study areas. By considering a wide range of features such as health, education and the local economy, associations can build a picture of the factors that make for a successful neighbourhood. This usually involves a wide range of issues and not just housing. Housing is only one factor amongst many and the determinants for relative success may vary from place to place. Indeed, some areas may be relatively successful yet may have features that would give different outcomes elsewhere. By understanding the bigger picture, associations can see which local factors are making a neighbourhood successful, or unsuccessful, and can use these to shape their forward strategic response. An increase in understanding of what makes a neighbourhood successful also equips associations to engage positively with wider partnerships. This can be on the basis of evidence – for example, if educational attainment in a neighbourhood is under achieving, this forms the basis for dialogue between housing and education to fashion a strategic response which is evidence based. Evidence also provides the basis for engagement with Local Strategic Partnerships to shape how association initiatives align with wider strategies. Essentially, the evidence based approach embeds association activity in the wider strategy for an area. This may develop further as the new Localism agenda becomes established. The National Housing Federation Neighbourhood Audit (2009) estimates c£430m p.a. is invested by associations into neighbourhoods and communities. Our study has highlighted how the evidence can support decisions on what to invest in and where to do so. The methodology also helps understand an area in detail and supports a strategic response based on evidence. It suggests that future investment of resources into community initiatives should be based on wider factors such as education, health, crime and employment, etc and link in with wider partnerships. In a regeneration scheme it offers a means to establish wider outcomes at the start of the process, thereby demonstrating a way to track return on investment, and to plot any improvement over time. For Stock Transfer associations or ALMO’s, it creates an evidence base of what is being delivered ‘before and after’ beyond a focus on ‘bricks and mortar’ issues. Tracking the impact of neighbourhood investment on stock values: it may be possible to monitor stock values to see if neighbourhood investment has a positive influence on values over time. The methodology adopted offers a potential means to measure the relative health of an area against a wide range of indicators such as health, economy, incomes, and educational attainment. The approach is useful for associations in that it allows this to be undertaken at relatively fine grain in keeping with much of their stock profile. The methodology could be developed further to begin to complement other RSL activity. For example, where RSLs undertake STATUS or other primary data gathering exercises the approach can provide more evidence to understand some of the trends which may have led to survey results. There may also be opportunities for the approach to provide an evidence base for Tenant Participation Strategies. It may even be possible to use the approach to support approaches to meet certain regulatory requirements.